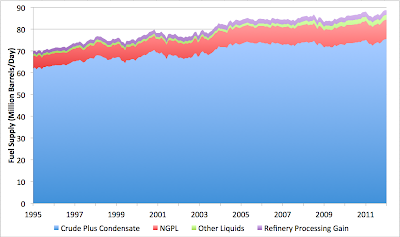 The EIA helpfully produces a breakdown of the global liquid fuel supply into components. 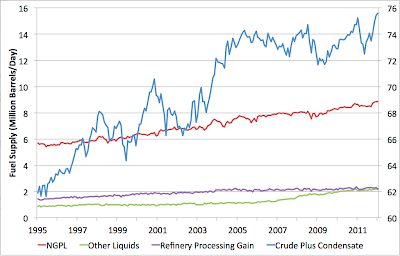 This allows us to distinguish change in the supply of "oil" - narrowly defined as crude oil plus condensates (hydrocarbons which come out of the ground as liquid) - from changes in other things (natural gas "liquids", most of which are actually gases like ethane, propane, and butane, ethanol, and refinery volume changes. 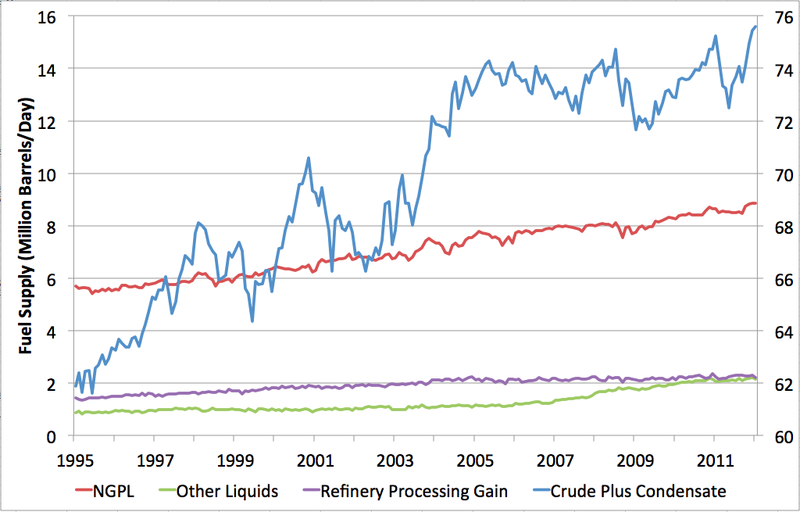 The above graph shows these four substreams - the crude and condensate (C&C) is on the right scale and the others on the left scale. This approach is designed to make it easiest to compare changes. The interesting news is that crude+ condensate, which has been pretty much plateaued since late 2004, has now made new highs. So clearly "peak monthly oil" is not behind us. At the same time, the data still seem to me to be consistent with the overall "peak oil moderate" worldview - that in 2005 we entered into a situation in which it became very difficult to raise oil production and that placed significant constraints on the global economy and made recessions more likely, but that the decline in global production will be slow and fears that this would lead to an abrupt collapse of the global economy were overblown (the "doomer" view). It was never my view, but the data would appear to still be consistent with a "horizontal drilling delaying the inevitable decline after which time it will be even more precipitous" type of scenario. Personally, I would have preferred to see some solid declines by now, so we could get on with the necessary adjustments. Stuart's mostly ignored EROEI, I'd assume since it's endlessly mutable, hence mostly useless for any real analysis. You'd as well attempt to quantify how evil the world is. I see that the STEO gives us 2.79 mb/d of spare capacity - rising to 3.50 mb/d in 2013, somehow. Maybe they're shorting the market? 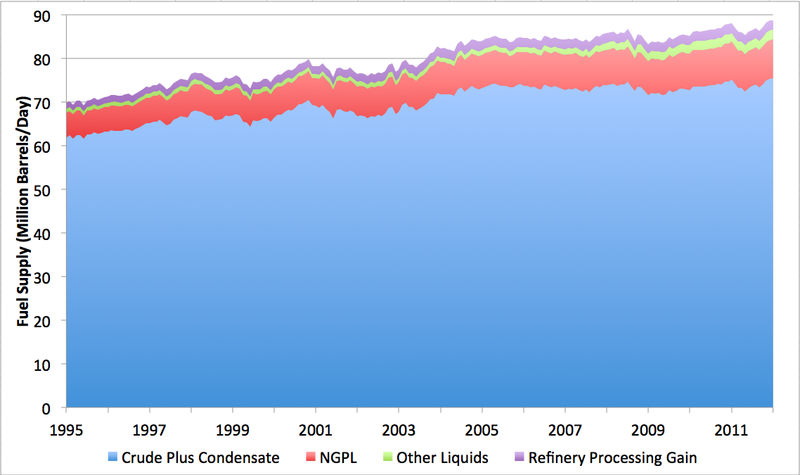 Finally, current spare crude oil production capacity, while estimated to be higher than during the 2003 to 2008 period, is quite modest by historical standards, especially when measured as a percentage of global oil production and considered in the context of current geopolitical uncertainties, including, but not limited to, the situation in Iran. With the rise in total global unplanned production outages over the last three months and the likely increase in non-discretionary inventories controlled by Iran, global spare capacity in March and April was estimated to average 2.5 million bbl/d, roughly equal to the average level in January and February. 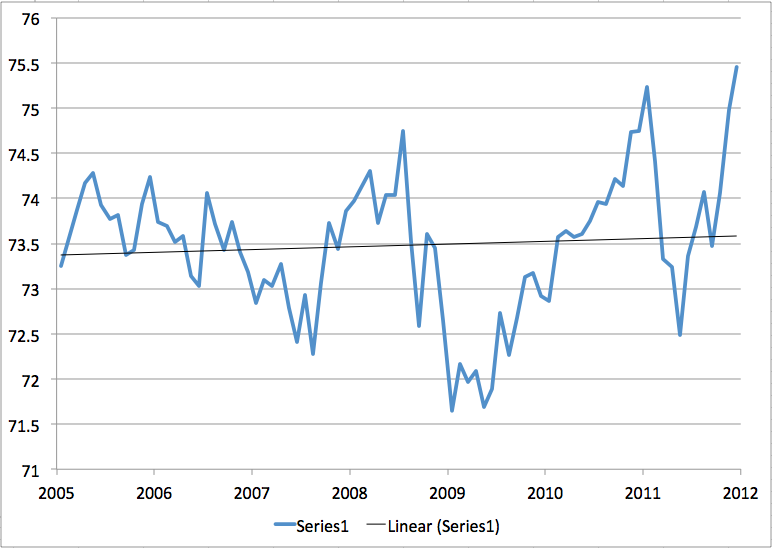 Oddly enough SC fairly crashed overnight in 2003, going from 5.43 to 1.92 in one year - a 3.51 mb/d loss. North Sea + Cantarell + Consumers Gone Wild at work, I guess. KLR - the reason I don't talk much about EROEI is not that I think it's useless as much as that I'm not aware of any blog-friendly way of estimating it for the main liquid fuels streams. As far as I know, there aren't any good stats on how much of the industry's output it consumes as input, and thus no basis for an independent input. It's too bad they don't break it down a little further, into "classic" crude in reservoir traps with water drive, crude that has to be manufactured, and crude from fracked shales. EROI is limited on the low side by the business acumen of the E&P companies and National Oil Companies. If EROI is very bad the E&Ps dont make money. 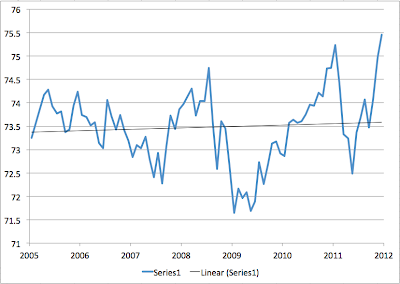 "At the moment, the plateau in C&C has a slight upward tilt.."
What's the price of WTI & Brent been doing recently?